I chose to do a project that features the first bead weaving stitch I ever learned: square stitch. I still love square stitch, with it's soothing rhythm and stiff structure. I thought it might be the perfect stitch for making a ring, which needs to have some structure to it. What I learned was that the beading thread matters too. I did not like the WildFire at first. I found it difficult to thread the needle, hard to coax the beads into place, and really a pain in the neck when you wanted to remove a bead. But the more I worked with it, the more I saw the value. Yes, you need to be really careful and try not to make mistakes (!!! ), but the stiffer feel to the work, when that is important to you, is quite impressive. I will definitely consider using it again when freestanding structure is an issue. The ring designs in the booklet use variations on basic stitches, including square, peyote, herringbone, and RAW. The photos and instructions are easy to follow. I changed the design that I made. It was supposed to have 3-bead picots on top and bottom. I didn't want them on the bottom, because it would have forced the ring to ride too high on my finger. Instead, I chose to use some of the larger beads that were sent and enhance the top edge more fully. 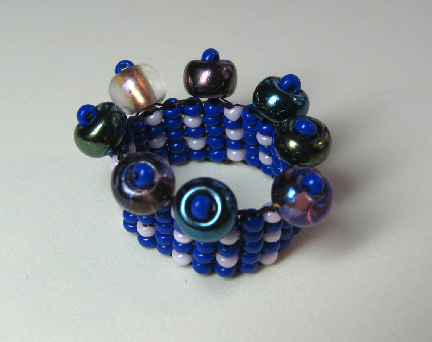 The gaps between the larger beads allow my fingers to slip right between them, making it very comfortable to wear. I'm not showing you a picture of it on me, however, because I have the world's ugliest hands!! Nice job, Cyndi, and very good tips. Thank you. I just got the "Dazzle It" book today. I've drooled over your bead weaving forever and have wanted to give it a whirl. The time has come! I did it, Cyndi! See my very first bead weaving project. Of course I picked the easiest design, but I'm pleased ... that I could do it and that it's actually fun - sort of zen. I used one of your tips. No scissors for Wildfire!! Of course, you figured out how to use the larger beads in your design, turned out great! I love it, so unique! I was trying incorporate the bigger beads. Very nice design. 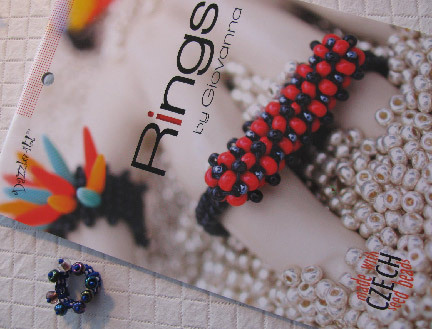 Cyndi, your finished ring and photo will inspire lots of new beaders to make a ring! Thank you for being a part of our blog hop!